Parkways are infrastructure that can adapt to an unpredictable future. Brooklyn is not known for its great streets. And yet, like Paris, it enjoys a remarkable legacy of several mid-19th century boulevards. At the same time that Baron Haussmann was building boulevards in Paris, Frederick Law Olmsted and Calvert Vaux, landscape architects for the Brooklyn Park Commission, designed and supervised construction of two major landscaped thoroughfares in Brooklyn. They called them parkways, and they didn’t picture them lined with six-story empire style buildings as Haussmann’s boulevards came to be. Olmsted and Vaux envisioned single-family houses on large lots. But the right-of-way cross section they designed for Eastern Parkway and Ocean Parkway was similar to that of the larger boulevards Haussmann was building in the western part of Paris, and almost identical to the extension of the Avenue des Champs Elysées west of the Etoile. These were wide and impressive streets with multiple roadways and many rows of closely planted trees. Like Haussmann, Olmsted and Vaux conceived their parkways as part of a grand design. 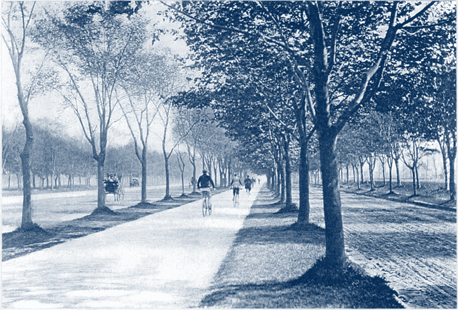 Eastern and Ocean were the first pieces of an extensive system of parkways that would weave throughout all of western Long Island, connecting parks and other public open spaces and giving structure to the anticipated suburban expansion of Brooklyn. 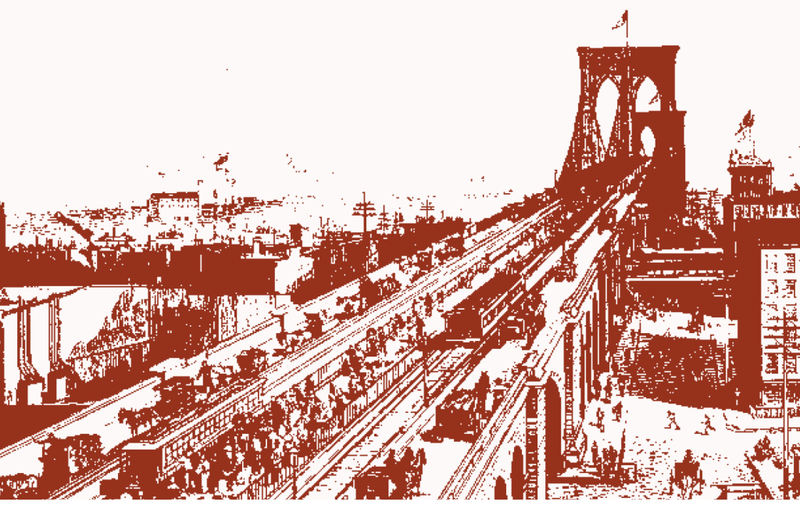 The rest of the parkway system was never realized as Olmsted and Vaux imagined it, but Eastern Parkway and Ocean Parkway were built in their entirety, over eight miles in combined length. They function today as major traffic arteries in Brooklyn, and yet they are also friendly to pedestrians and do not impose barriers that divide the city. While carrying exceptionally large volumes of through traffic—between 50,000 and 70,000 vehicles per day—they also serve as local traffic carriers, neighborhood parks, and recreational greenways. In addition, they are valued residential streets, despite the traffic. Such multiple functions are unusual for heavily traveled streets in American cities. Indeed, accepted street-design practice today would not allow either of these parkways to be built because their physical form is too complex according to modern arterial street standards. That form provides space for different activities to occur in close proximity but within separate zones. Both streets have essentially the same physical configuration. They are 210 feet wide and have three roadways: a wide roadway in the center (65 feet on Eastern Parkway and 70 feet on Ocean Parkway) and narrow roadways along each side (25 feet on both streets). Two malls (35 feet wide on one and 30 feet wide on the other) separate the three roadways, each lined with two rows of trees. There is another row of trees lining the sidewalks in front of the houses. The scale and diversity of activity along the six rows of trees is remarkable. Fast traffic moves in three lanes in each direction in the center roadway, while slower local traffic moves on a single one-way lane on each of the access roadways. But forget the traffic for a moment and look at the people. The separating malls are much more than roadway dividers: they are the realm of pedestrians and bicyclists. Walkways run down the length of each mall, and one mall on each street also has a bicycle path. On Ocean Parkway the malls are lined with an almost unbroken line of concrete and wood-slat benches, each over twenty feet long, facing toward the center. Eastern Parkway has newer, more widely spaced benches. 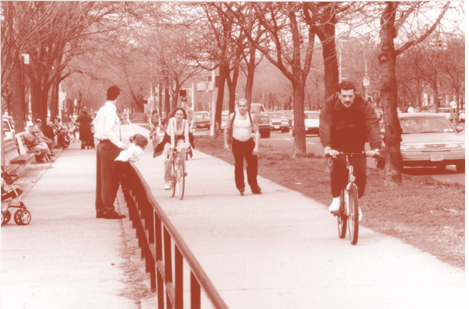 On both streets, people congregate on the benches in large numbers; at any given time there are lots of people walking or bicycling—older people, families with children, young people. The trees on the malls provide a transparent fence between these slower-paced activities and the faster traffic moving in the center roadway. The reason it would be difficult to build Eastern Parkway and Ocean Parkway today is the very complexity of activities their design accommodates. Streets designed today to carry large volumes of through traffic are also designed to discourage other uses, the rationale being efficiency and safety. Eliminate complexity, and traffic will move faster, the planners say; remove pedestrians and there will be fewer traffic conflicts. With malls designed to encourage pedestrian use and a multiple roadway configuration that calls for complex intersections, these parkways defy conventional planning guidelines. And yet, our analysis of accident data for both parkways found no more accidents here than on comparable, normally configured streets carrying similar volumes of traffic. And, because it is given clear priority at intersections, traffic flows as easily on the center roadway as on modern arterial streets elsewhere. 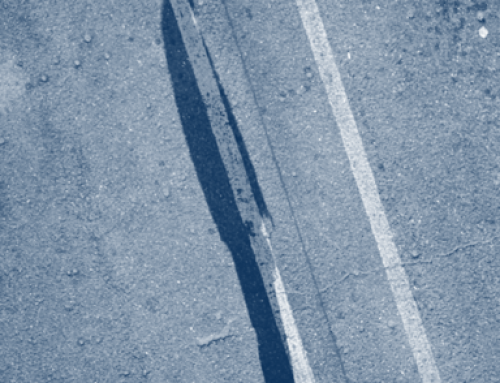 So, what can we learn from Eastern and Ocean Parkways? They may be anomalies, even curiosities, but they are not anachronisms. Today, many people—city planners, traffic engineers, and lay citizens alike—question the wisdom of building streets that divide cities, and single- purpose major traffic roads designed to today’s standards tend to do just that. Likewise, many are questioning the wisdom of planning streets solely for car movement at the expense of other uses. Brooklyn’s parkways prove that complex major traffic streets can function well in today’s cities. Eastern Parkway and Ocean Parkway are working examples that manage to serve significant volumes of through traffic while also supporting different types of street use. They suggest we should expand our repertoire of major street designs to include a wider range of civic purposes than simply moving traffic. 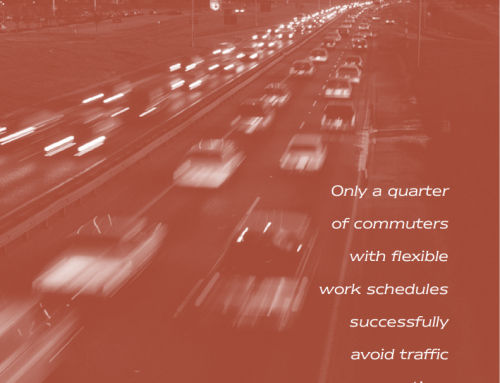 Eastern and Ocean Parkways are exemplars of public works designed for flexibility and adaptability over the long term. During the 125 years since they were built, these streets have accommodated a variety of traffic types, ranging from horse-and-carriage to automobile. Olmsted and Vaux specifically designed them to serve emerging roadway uses. 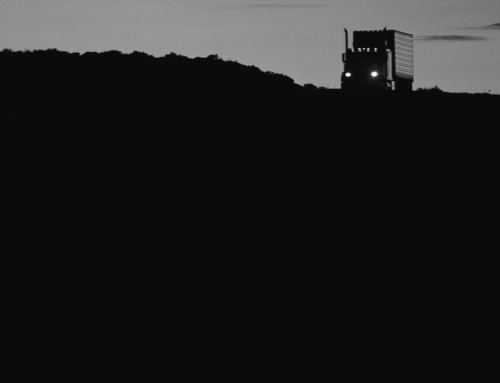 The physical form has proved resilient as the differentiated zones have accommodated unforeseeable changes in transport technology and human activity without the need to reconfigure the roadways. At various times, various groups of people with different agendas, using various means of transportation, have vied for rights to use certain spaces on the parkways in particular ways. Customs developed which eventually became codified into regulations. On Ocean Parkway, the center roadway was originally the exclusive domain of fast horse-drawn carriages, while two-way commercial wagon traffic used one of the side roads. Equestrians filled the other, and pedestrians used the malls. 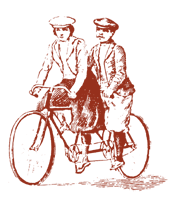 Around the turn of the century, when bicycling became popular, the malls were designated exclusively for bicyclists, while pedestrians used the sidewalks. The current use pattern was established in the 1930s, after automobiles came into general use. Recently, people using rollerblades have joined bicyclists on the bike path. The physical form of these streets allows them to carry lots of traffic without turning the area into a traffic wasteland. With trees, benches, and houses facing the street rather than turning their backs to it, the parkways are places that local people want to inhabit. These attributes also encourage those living in surrounding neighborhoods to claim the streets as their territory as well, and thus to value and care for them. The head park commissioner when the plans were proposed, James Strannahan, enthusiastically adopted the Olmsted-Vaux plan and pressed for construction. A lot of opposition initially raised doubts about the project’s fate, however. Understandably, many opposed the tax assessments attached to the project. 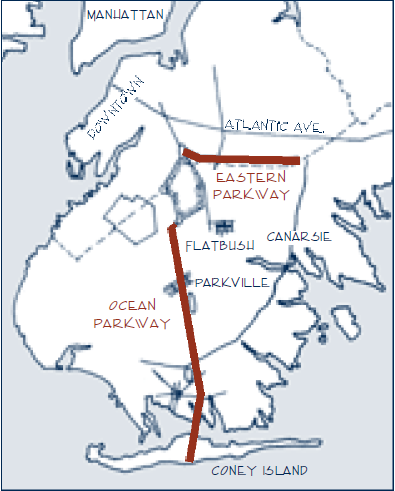 (There was more resistance along Ocean Parkway than Eastern, because the latter was built within the city limits while the former was built outside them. Also, Eastern Parkway lands were owned by real estate entrepreneurs, while Ocean Parkway’s were held by farmers who favored a new roadway, albeit not such a wide one.) But once the assessments were transformed into a general tax, to be borne by all Brooklyn property owners, opposition declined. The shift of financial burden to the entire citizenry was in keeping with the spirit behind the parkways. Yes, they were intended to pave the way for suburban expansion, but their higher purpose was to serve as recreational promenades for all residents of the city. They were to be park-like spaces where gregarious, community-building activities could take place. Under Strannahan’s guidance, the streets were completely built within the space of just a few years, reaching out beyond the already developed areas of the city in expectation that expanding suburbs would eventually grow to require them. Imagine the undertaking—a right-of-way 210 feet wide, extending 21⁄2 miles on Eastern Parkway and 51⁄2 miles on Ocean Parkway. Imagine planting the six rows of trees—thousands of them spaced 25 feet apart in continuous lines through open countryside. This was surely an exceptionally farsighted civic achievement, especially considering that but little development would occur around either street for almost fifty years. Initial jurisdictional arrangements fundamentally shaped the projects. When built, the streets were controlled by the parks department rather than the public works department. This arrangement lasted until well into the late 20th century, when the public works department took over roadway maintenance. The long-standing jurisdictional arrangement meant that engineers could not have their way with these streets as easily as with other streets. However, at various times, selected people simultaneously controlled both the parks department and highway construction entities—notably during the reign of Robert Moses. During these periods a bit of luck, combined with public understanding that the parkways were parks as well as trafficways, saved the streets from reengineering. In the end, the value that local residents placed on the special qualities of these streets saved them from destruction. Ocean Parkway almost lost its malls in the 1970s because conditions attached to a federal paving grant required adherence to current arterial street standards. That meant adding about eighteen feet to the center roadway, thereby reducing each mall by nine feet and eliminating a line of hundreds of trees. The trees had, for years, not only shaded pedestrian activities on the malls, but also acted as a buffer between pedestrians and the fast traffic in the center roadway. Residents did not want these drastic changes and were willing to forgo repaving to keep the malls. It took a great deal of political engagement, but the residents won the day: they successfully fought the reengineering initiative as well as a compromise proposal that called for building twenty-inch-high concrete curbs along the edges of the malls. Incidentally, they also managed to retain the paving grant. How might such streets get built today, given the enormity of the costs associated with wide rights-of-way and extensive tree planting? 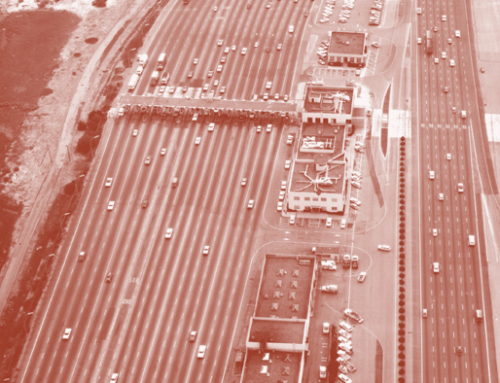 In some circumstances expenditures might be even less than for streets built for similar traffic loads—for instance, limited-access urban expressways that require expensive concrete structures. Further, the rights-of-way could be narrowed without losing all the qualities that make Eastern and Ocean Parkways desirable. There are many examples of Parisian multi-way boulevards that are only 120 to 150 feet wide. Several appropriate locations and circumstances for such boulevards suggest themselves, such as New Urbanism planned developments, existing urban areas where citizens want to improve the physical quality of their environments. Or, more likely still, suburbs that, like Brooklyn in 1870, anticipate further expansion and insist that it be decent and humane, as well as efficient. Because they were never “modernized,” Eastern Parkway and Ocean Parkway prove that seemingly antiquated designs can be as desirable for our time as for theirs. More than that, the currently rapid pace of technological development and shifting life styles should be enough to induce considerable humility among those who would plan infrastructure that will last a long time. The success of these parkways, so long after they were conceived and installed, is evidence enough, if any were needed, that public works can be adaptable to large-scale changes. 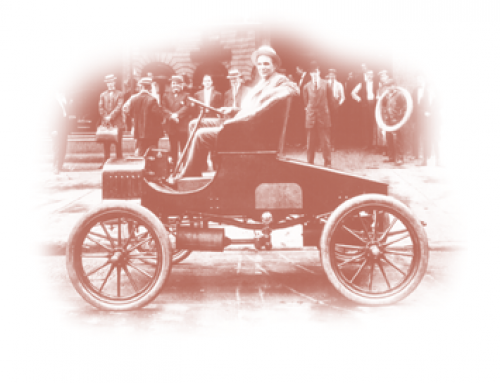 None of us can yet predict what shapes the automobile’s successors and their roadways will take or how they’ll be used. So, we face a major challenge: to design public works in adaptive forms that will be likely to accommodate future surface transport as it evolves over the long-term. Olmsted and Vaux succeeded precisely because they designed the parkways to accommodate many diverse activities, thereby creating an infrastructure that could adapt to an unpredictable future. Allan B. Jacobs, Great Streets (Cambridge: MIT Press, 1993). Peter Bosselmann and Elizabeth Macdonald, “Livable Streets Revisited,” Journal of the American Planning Association, v. 65, no. 2, pp. 168-180, 1999. Ken Greenberg, “The Street, A Creature of Compromise,” Places, v. 11, no. 2, pp. 8-11, 1997. Allan B. Jacobs, Elizabeth Macdonald, and Yodan Rofé, The Boulevard Book (Cambridge: MIT Press, forthcoming).